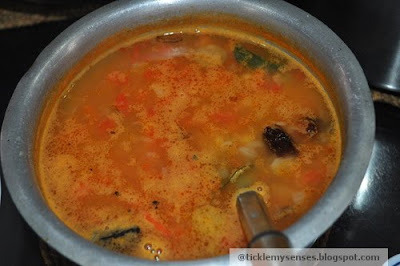 Tickle My Senses: Mangalore style Daaliso saar with Bimblee - Lentil Soup, My Mom's Way. Mangalore style Daaliso saar with Bimblee - Lentil Soup, My Mom's Way. This is the recipe for traditional Daaliso saar with Bimblees (lentil soup) made at home to accompany white or boiled rice and a meat dish. I learned this recipe from my mum who learned it from her mom . Alongside with masala fried fish the combination is sublime. 1. Take all ingredients for the dal in a pressure cooker with 2 cups water and allow 2 whistles on medium heat. 2. In a large vessel take oil, when hot add crushed garlic, curry leaves and hing. Fry till garlic is brown and fragnant. Add cooked dal immediately over seasoning. Add water if thinner consistency is required. Check salt. Bring to boil. Serve with boiled rice, masala fried fish and dry vegetable sukke on side. 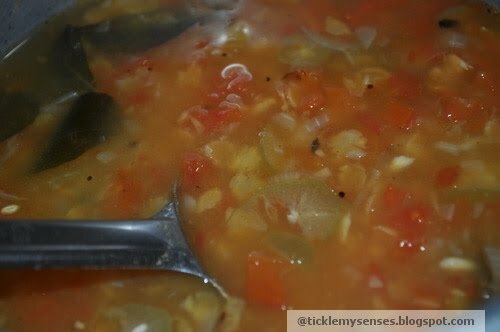 Tried it yesterday and delicious... thanks for the simple recipe ..
Love the way this dal looks, does it have mustard in the seasoning? Hi Anonymous, thanks for stopping by. No this dal has no mustard in its seasoning. You could use 1/2 a tsp of mustard seeds if you like. Bimblee == ?. Is it Kokum? As my mom says: "Tukka deo bare karo"
Thankyou for stopping by. Apologies for the delay in replying. A good substitute for bimblee is raw mango, howevere you could even use kokum. Thanks for your appreciation "Tukka deo bare karo"
I liked the receipe. I prepare it the same way but this time I did not add the ginger and did not season with mustard.